Designed and developed website for the not-for-profit organisation providing residential and community care services to several thousand elderly and disabled persons throughout Australia. 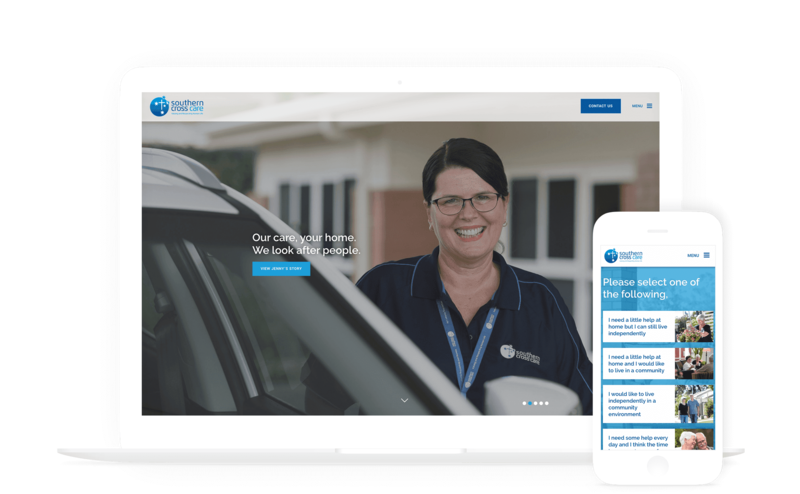 Brand Partners approached The Digital Embassy to develop and design an updated, more user intuitive and mobile responsive website for their client, Southern Cross Care Queensland. The fundamental requirement for the new website was to highlight the residential homes as a desired lifestyle choice. In order to do so it needed to provide visitors with a warm and engaging visual representation of the various retirement villages and services available, and also provide a user experience which was informative and relevant to their specific needs and location. Supporting these unique features would be content that conveys a welcoming tonality to give Southern Cross Care a strong point of difference in a competitive landscape. The website was to be developed using WordPress and optimised for use on desktop and handheld devices with a strong focus on user interactivity and product selection. One of the main user features is the dynamic postcode and suburb location map search function which is utilised on Retirement Living and Residential Living pages. This functionality allows the user to search for a housing options near their current location to allow them to minimise their daily disruption as part of a relocation to keep existing relationships with doctors, hairdressers, dentists and similar. At the completion of the project the client was presented with a highly engaging and customer-centric website that allows easy property selection and navigation between location and housing options. The website showcases all of the valuable service and product offerings available from Southern Cross Care, as well as an in-depth library of informative FAQ’s detailing the myriad of lifestyle, health and housing related topics and services.